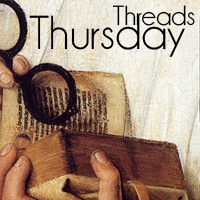 Historical Tapestry: Thursday Threads - Where and What are you reading? Thursday Threads - Where and What are you reading? Where and What are you reading? I read and reviewed this one a couple of weeks ago. Loved it ever so much. Made quite an impact on me. I just finished reading and reviewing Kay Bratt's short novella, Train To Nowhere, set against the background of China's Cultural Revolution. I'm now reading The Corpse Reader By Antonio Garrido which takes place in Ancient China. I just finished "The Boleyn King" by Laura Andersen last night and am pondering what to say in a review. Now, I have to choose something else... It'll probably be "My Apprenticeship" by Collette, one of my favorite writers of French literature. I just posted a review for Lighthouse Bay by Kimberly Freeman. I enjoyed the book. The book's location was Australia. Last week, finished Lauren Willig's THE ASHFORD AFFAIR (England, New York, and Africa) and the week before that I finished THE NIGHT CIRCUS. Both were supremely excellent!